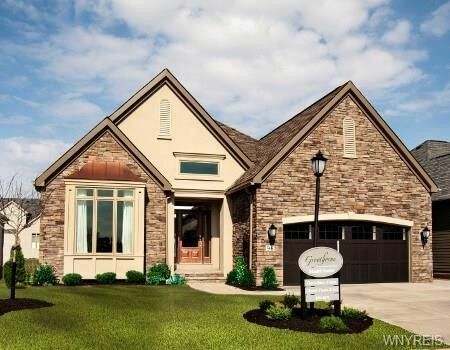 This Breathtaking Model views the Country Club of Buffalo. Featuring: 9' Ceilings, 8' tall doors, Large LV RM with a custom entertainment center that opens up to a Sunroom that has an indoor/outdoor gas fireplace surrounded by a porcelain tile wall. The serene patio features pavers and extensive landscaping. First Floor master suite with a custom tray ceiling, wic, bath includes a heated floor, custom shower and granite countertops. The gourmet kitchen has painted cabinetry, 9' island, ss DCS commercial grade oven and two drawer dishwasher. This home also has a 2nd bedroom with en suite, den with 8' tall French doors and custom floating shelves. A finished lower level includes an entertainment area with a game room, floating bar, and craft room (third bedroom) with en suite. 1225 sq ft.